Umpire Angel Hernandez filed a lawsuit against Major League Baseball alleging racial discrimination, seeking back pay and unspecified compensatory damages, according to a Complaint filed by Hernandez in United States District Court for the Southern District of Ohio, Western Division, and obtained by Close Call Sports. Hernandez specifically is alleging that MLB's discrimination—which began as soon as Joe Torre joined the Office of the Commissioner—has resulted in a refusal to select him to officiate the World Series, as well as a refusal to promote him to Crew Chief. 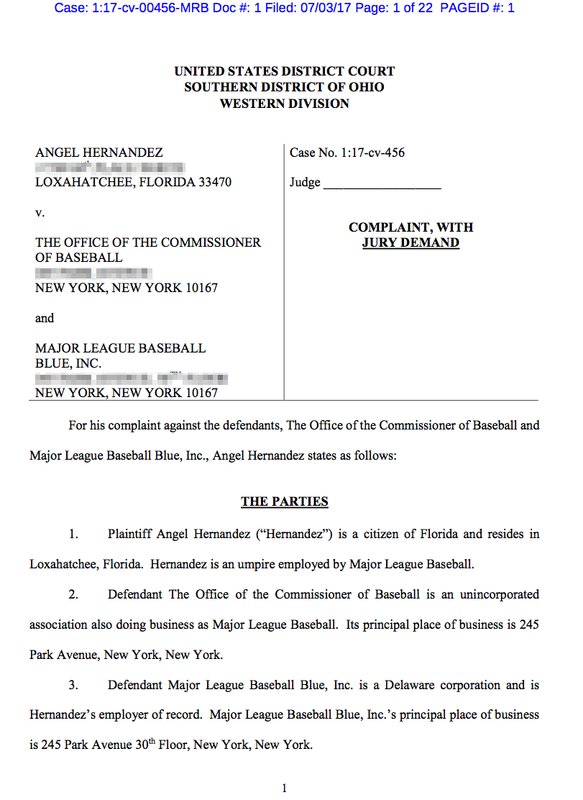 The suit against the Office of the Commissioner ("BOC") as well as Major League Baseball Blue, Inc. (Hernandez's technical employer) alleges that Hernandez, due to MLB's racial discrimination, suffered adverse employment actions through MLB's refusal to select him to work various World Series, and its refusal to promote him to the position of Crew Chief. Hernandez seeks a jury trial for his case. First page of Hernandez's Complaint. The suit alleges that despite Hernandez's qualifications and experience, Hernandez has not been chosen for a World Series assignment or the position of Crew Chief and, instead, less qualified individuals—"the vast majority of which have been white"—have been chosen for the Fall Classic or for promotion to Crew Chief. 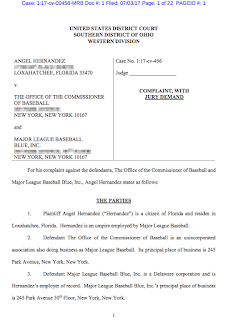 Hernandez's suit alleges that the selection of "these less qualified, white individuals" was motivated by racial, national origin, and/or ethnic considerations, and that MLB's actions were "intentional, with reckless disregard for Hernandez's rights." For instance, Hernandez claimed that in 2011, his accuracy percentage was 96.21%, compared to a staff average of 95.67%. The suit makes reference to a potential personal feud between Hernandez and MLB Chief Baseball Officer Joe Torre. 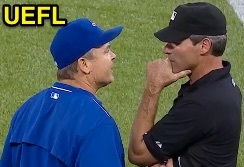 Ump Angel Hernandez in New York. The complaint introduces a May 4, 2001 quote from then-Yankees Manager Joe Torre, who, unhappy with a call he perceived to be incorrect, told the media that "[Hernandez] seems to see something nobody else does...you'd like to have him sit down and watch the video, something I'm sure he doesn't do." Torre went on to say, that had Hernandez reviewed the video, "he would look like a fool...I think he just wanted to be noticed over there." The suit references Hernandez's yearly umpiring evaluations, which Hernandez alleges, took a sinister turn in 2011, the year Torre joined BOC as the Executive Vice President of Baseball Operations. Hernandez exhibits his situation handling skill. "You need to work on your communication skills with on-field personnel, particularly because your approach has fostered a Club perception that you try to put yourself in the spotlight by seeing things that other umpires do not." Hernandez alleges that these and similar comments echo the May 4, 2001 quote from Torre, despite the fact that, prior to 2011, Hernandez was purportedly praised on a routine basis for situation-handling, including situations involving warnings and ejections. The suit claims that as recently as 2010, Hernandez received an "exceeds standard" rating for his in-game situation handling management. The suit also grieves Hernandez's 2011 evaluation of "meets standard" for his base judgment, which Hernandez claimed was inconsistent with comments on the report that stated he worked "with a tremendous amount of instinct," and hustled with a "positive 'feel' for the game." The report, issued in the middle of the 2011 season, had also purportedly stated that Hernandez "had not missed a single call for the first half of the 2011 season." Related Post: Yankee Stadium Boundary Catch Part II: Hernandez Hustle (10/11/12). The suit claims that MLB, "for no valid reason, decided to break up Hernandez and his long-time crew chief Joe West." In 2011, we reported the split, as a rumored "result of actions taken by none other than MLB's current Executive Vice President of Baseball Operations, Joe Torre." 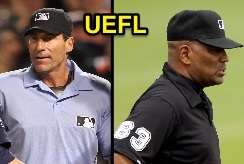 Related Post: Umpire Odds & Ends: West & Hernandez; Say it Ain't So, Joe (7/14/11). Hernandez claims the 2011 Year-End evaluation similarly echoed Torre's 2001 comments by stating that "battling the perception of the Clubs and the media that [he was] routinely attempting to put [himself] in the spotlight." In sum, Hernandez claims that both 2011 evaluations are at odds with individual observers' reports that consistently praised Hernandez as "calm," "professional," "businesslike," and/or "composed." The suit cites several observer comments to suggest BOC's remarks were off-base, including "Amgel [sic] is a hard worker and great example for other umpires," and "[Hernandez] is a very good umpire." Hernandez gets in position on a pickoff play. In 2012, BOC on its evaluation of Hernandez again purportedly stated the "perception of the Clubs and media that [Hernandez was] routinely attempting to put [himself] in the spotlight," while allegedly contradicting itself with a note that Hernandez "should be proud of a lot of" his work as an interim crew chief. Hernandez also took issue with a 2013 evaluation which one again allegedly made reference to a "perception" of Hernandez as an umpire ("...will likely battle the perception of the Clubs and media that you are routinely attempting to put yourself in the spotlight for some time..."), while purportedly writing that his "mechanics were picture perfect and emulated by less-experienced umpires." Insofar as the Crew Chief role is concerned, Hernandez cited statistics purporting that of the 77,760 regular season games played from 2000 through 2016, zero have featured a permanent minority crew chief, noting that, despite Hernandez's interim crew chief roles in portions of the 2005 and 2012 season, only one of the ten umpires promoted to Crew Chief since 2011 had more experience or was more qualified than Hernandez. Prior to the 2017 season, Hernandez and the umpires' union, the World Umpires Association, requested a written explanation from BOC as to why Hernandez was not promoted to Crew Chief for the 2017 season. The suit references a March 27, 2017 letter from Joe Torre, which allegedly stated that Hernandez needed to "gain greater mastery of the Official Playing Rules and Replay regulations, continue to improve [his] situation management, and display an ability to refocus and move forward after missing calls or receiving constructive feedback from the Office." The suit states that BOC's issues with Hernandez's performance only became an "issue" in 2011, after Torre assumed his Executive VP role with the Commissioner's Office. Hernandez concluded by reiterating the "noticeable tonal shift in Hernandez’s evaluations" since Torre arrived in the Commissioner's Office prior to the 2011 season. Hernandez and Laz Diaz umped in Cuba. 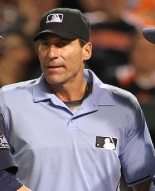 Born in Havana, Cuba, in 1961, Angel Hernandez has been an MLB umpire since 1991, and has worked 8 Division Series (1997-98, 2002, 05, 09, 11-12, 15), 7 League Championship Series (2000-01, 03-04, 07, 10, 16), and 2 World Series, his latest in 2005 (also 2002). Though not named as a party nor witness in the lawsuit, American-born Laz Diaz is a fellow MLB umpire with ties to Cuba. Both he and Hernandez went to Cuba in 2016 to officiate the Rays-Cuba series in March of that year. Like Hernandez, Diaz has worked several Division Series, League Championship Series, and one World Series (2007), but has not been back to the Fall Classic since then, despite working the DS in 2013-14 and LCS in 2015-16. Hernandez filed two Charges of Discrimination with the Equal Employment Opportunity Commission (EEOC) in June 2017, prior to the initiation of the legal complaint. After the EEOC issued to Hernandez a Notice to Right to Sue, Hernandez proceeded to bring the suit. He seeks full back pay (including legal fees and expenses), compensatory and punitive damages, all employment benefits he would have enjoyed had he not been discriminated against, an injunction against MLB, and a jury trial. Complainant: Angel Hernandez, Loxahatchee, Florida. Respondents: The Office of the Commissioner of Baseball and Major League Baseball Blue, Inc. (collectively, "MLB"). Allegations: COUNT ONE: Discrimination in violation of Title VII of the Civil Rights Act of 1964. Allegations: COUNT TWO: Discrimination in violation of Section 1981. Allegations: COUNT THREE: Discrimination in Violation of Ohio Revised Code § 4112.02. Allegations: COUNT FOUR: Declatory Judgment. Prayer for Relief: Full back pay, compensatory damages for all harm to Hernandez—including emotional distress, humiliation, and other damages caused by MLB's conduct—punitive damages, all employment benefits he would have enjoyed had he not been discriminated against, an injunction against MLB, and a jury trial. As to Counts One and Three, Hernandez alleges that MLB discriminated against Hernandez on the basis of his race, color, and/or national origin. As to Count Two, Hernandez alleges that MLB intentionally discriminated against Hernandez on the basis of his race and/or color. Under these three Counts, Hernandez identified as a member of the Latino protected class. As to Count Four, Hernandez seeks declaratory judgment and permission to discuss the defendants' conduct without penalty, including but not limited to disciplinary action or retaliation. Hernandez is represented by Kevin L. Murphy and J. Jeffrey Landen of Murphy Landen Jones PLLC. The case is Hernandez v. The Office of the Commissioner of Baseball et al., case number 1:17-cv-00456, in the U.S. District Court for the Southern District of Ohio.